Queen guitarist Brian May has revealed that the band are to release their own version of popular board game Monopoly later this year. He posted an image of the box along with the six player tokens that will be included with the set. They reference Bicycle Race from 1978’s Jazz album, Hammer To Fall from 1984’s The Works, a vacuum cleaner from the I Want To Break Free video, a radio from classic track Radio Ga Ga, the robot from the cover of 1977 album News Of The World and a guitar. Revealing the player pieces, May says on his website: “So somebody leaked this info. I should have leaked it myself! 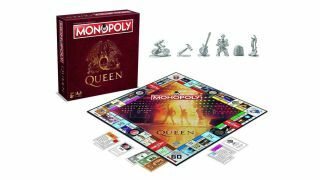 I think Queen fans will love our new Monopoly game. “Launch of our fabulous new official Queen Monopoly game scuppered by a leak to Amazon! But you guys will love it I’m sure. I do. And showcasing the box, May reports: “Yes, it’s true! We’ve been very secretly developing Queen Monopoly for over a year. And it’s due in a shop near you in May. In 2015, Queen launched their Bohemian Rhapsody beer to celebrate the track’s 40th anniversary. Earlier this month, May announced details of his new album with Kerry Ellis titled Golden Days. It’ll be released on April 7 via Sony Music and is now available for pre-order.